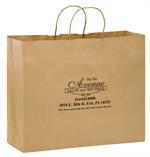 Natural Twisted Paper Handle Shopper: 8" x 4 3/4" x 10 1/4"
This natural paper shopping bag has twisted paper handles. 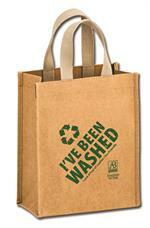 These craft bags are made of 100% recycled materials.Size: 8" x 4 3/4" x 10 1/4". Imprint Area: 5" x 4". Prices range from .64 to .44 each. 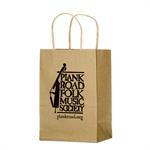 Natural Paper Shopper: 10" x 5" x 13"
This natural paper shopping bag has twisted paper handles. These craft bags are made of 100% recycled materials.Size: 13" x 7" x 17".Imprint Area: 8" x 7" Your logo is screen printed in ink.Prices range from .69 to .44 each. Natural Twisted Paper Handle Shopper: 13" x 7" x 17"
This natural paper shopping bag has twisted paper handles. These craft bags are made of 100% recycled materials.Size: 13" x 7" x 17".Imprint Area: 8" x 7" Your logo is screen printed in ink. Prices range from .75 to .47 each. 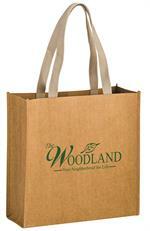 Natural Paper Shopper: 16" x 6" x 12"
Our large Natural Kraft shoppers have twisted fiber handles and are flexo printed. This bag is 16" x 6" x 12" and has a 9" x 5" imprint area. Prices range from .75 to .47 each. 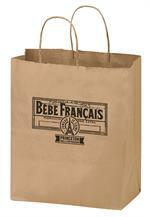 Natural Paper Shopper: 16" x 6" x 19"
Our Natural Kraft shoppers have twisted fiber handles and are flexo printed. This bag is 16" x 6" x 19" and has a large 8" x 8" imprint area. Prices range from .79 to .54 each. 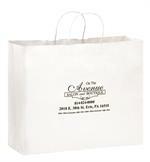 White Twisted Paper Handle Shopper: 8" x 4 3/4" x 10 1/4"
This white paper shopping bag has twisted paper handles.Size: 8" x 4 3/4" x 10 1/4".Imprint Area: 5" x 4"Prices range from .73 to .46 each. 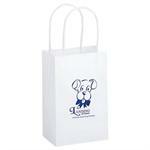 White Twisted Handle Paper Shopper: 10" x 5" x 13"
This white paper shopping bag has twisted paper handles and is 10" x 5" x 13" and has a 5" x 7" imprint area. Prices range from .75 to .46 each. White Twisted Handle Paper Shopping Bag: 13" x 7" x 17"
White twisted paper handle shopper bag is 13" x 7" x 17" and has a large 8" x 7" imprint area. Prices range from .79 to .52 each. 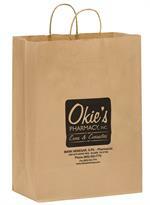 Natural Twisted Paper Handle Shopper: 5 1/2" x 3 1/4" x 8 3/8"
These small custom printed paper bags are perfect for small items. Available in Natural Kraft or White. Prices range from .69 to .44 each. White Twisted Handle Paper Shopper: 5 1/2" x 3 1/4" x 8 3/8"
Ideal for gift shops, this paper shopping bag has twisted paper handles and is 5 1/2" x 3 1/4" x 8 3/8" with a 3" x 3" imprint area. Prices range from .73 to .46 each. 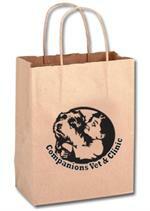 Natural Paper Shopper: 5 1/2" x 3 1/4" x 12 1/2"
Custom printed kraft paper wine bag is perfect for one bottle of wine. Prices range from .69 to .44 each. 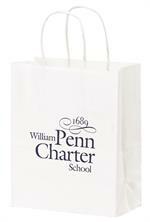 White Paper Shopper: 16" x 6" x 12"
Our large White Shoppers have twisted fiber handles and are flexo printed. This bag is 16" x 6" x 12" and has a 9" x 5" imprint area. Prices range from .79 to .52 each. 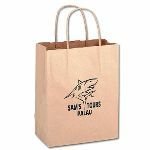 Cyclone Washable Kraft Paper Tote: 8" x 4" x 10"
Our new Cyclone Washable Kraft Paper Tote bag is taking the Industry by storm! This earth-friendly, beautifully crafted Heavy-weight Natural Kraft Paper Tote Bag has crisp fold lines and natural color web handles. Prices range from $5.59 to $4.29 each. Cyclone Washable Kraft Paper Tote: 13" x 5" x 13"
Our new Cyclone Washable Kraft Paper Tote bag is taking the Industry by storm! This earth-friendly, beautifully crafted Heavy-weight Natural Kraft Paper Tote Bag has crisp fold lines and natural color web handles. Prices range from $7.49 to $5.75 each.